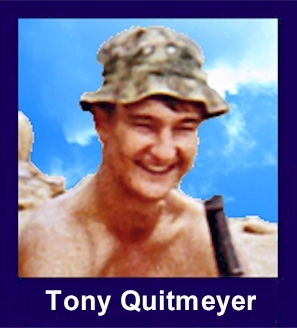 The 35th Infantry Regiment Association salutes our fallen brother, SP4 Tony John Quitmeyer, who died in the service of his country on January 8th, 1968 in Quang Tin Province, Vietnam. The cause of death was listed as Rocket/Mortar. At the time of his death Tony was 19 years of age. He was from Parkers Prairie, Minnesota. Tony is honored on the Vietnam Veterans Memorial at Panel 34E, Line 10. The decorations earned by SP4 Tony John Quitmeyer include: the Combat Infantryman Badge, the Bronze Star, the Purple Heart, the National Defense Service Medal, the Vietnam Service Medal, the Vietnam Campaign Medal and the Vietnam Cross of Gallantry with Palm Unit Citation. Tony and I served together and became friends instantly. His smile and personality are hard to forget. I think of him often and shed a tear at the thought of our loss. I will always remember and miss you Tony. Tony was one of my best friends in High School. His sense of humor and athletic ability are to be remembered. My last recollection of Tony was standing on the High School football field where we had done battle as High School athletes. He told me that with the bonus he would receive from going to Viet Nam, he could buy a brand new car upon his return. We miss you, Tony. We'll never forget you, Tony. If you're watching over us today, please put a smile on that handsome face and remember you'll never be forgotten. "More troops were on the way to reinforce 4-31. During the early evening hours of 8 January the Americal Division had directed the 2-35th Infantry, 3d Brigade, 4th Infantry Division into the Hiep Duc Valley. The 2-35th Infantry would share FSB West with 4-31 and operate between Hill 445 and the Chang River. The battalion's Company D would go first, with the remainder of 2-35 closing sometime on the 10th. Shortly before 1600 the company commander of D/2-35 and one of his platoon leaders landed on the FSB's resupply pad (Company D had the task of setting up security in the 2-35 sector of the firebase). The new officers were standing near the pad, probably trying to get their bearings, when Lt Ervin P. Bridges Jr. walked over to give them a friendly warning. The FSB had been subjected to a healthy amount of mortar fire for the past week and the crisply pad was one of the Nova's favorite targets. Bridges told Lt. Chat Larson later that he went over and told the company commander that it would be a good idea if he dispersed his people because the NVA had their pad zeroed in with their 82mm mortars. The captain told him something like, "Lieutenant, you let me worry about my people." Knowing better than to argue with a captain, Bridges turned and walked away. Shortly afterward--maybe a minute--a mortar round slammed into the pad, Killing the platoon leader (Blankenship) and severely wounding the company commander." "By 0430 (9 January) the movement had ceased, and the NVA pulled back down the hill. Mellon reported the company at 50 percent alert. Company D, 2-35th Infantry, in positions on the south side of the perimeter, had two (Jackson and Quitmeyer) killed and three wounded during the NVA attack." "At the end of February, the 3d Brigade, 4th Infantry Division ceded its operational area to the 196th LIB and, minus the 2-35th Infantry that followed later, moved south to rejoin the 4th Infantry Division. ... When the dust settled 4-31 was on LZ Colt; 1-6 had secured LZ Baldy; 2-35 had FSB Ryder; 2-1 was at LZ Ross; 3-21 remained on FSB Center; and 1-1st Cavalry Squadron continued to operate in the eastern sector of the Que Son Valley and the coastal lowlands."